What should you be doing while I am away? 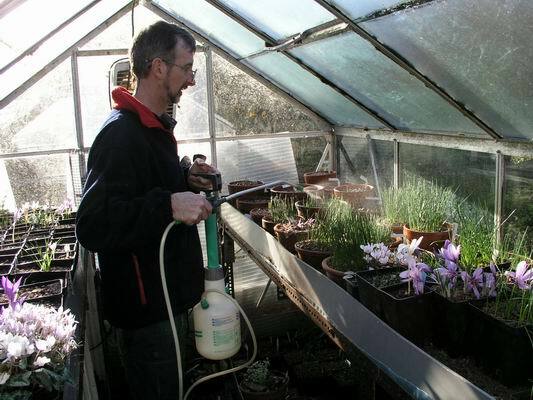 Spraying against aphids is the important job as the new leaves are emerging. Their lush young growth is highly attractive to aphids whenever there is a mild spell. 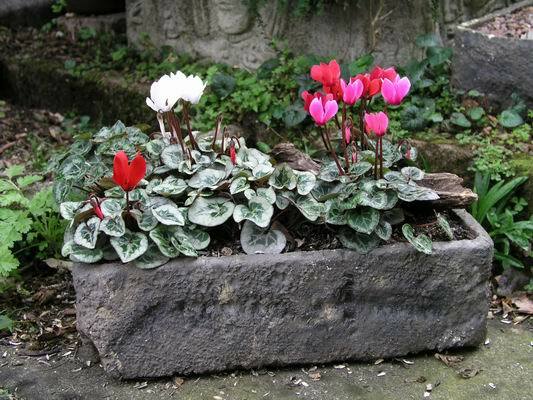 Also when the weather is mild, remember to water the pots that have leaf growth showing. 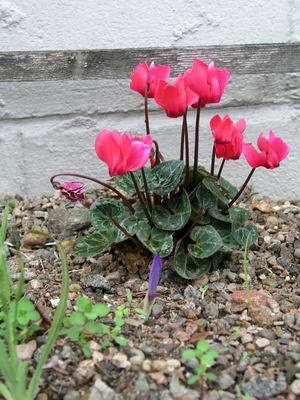 These are some of the mini-cyclamen that we bought in September. I washed the compost from their roots and planted them in a 'fish box trough' where they are growing well. As an experiment I have planted a few of them in the narrow south facing bed below our kitchen window to see if they will come through the winter. I may place a small cover over them in the worst weather. Below are a few plants that should be in flower while I am in North America. Colchicum laetum growing in a mesh basket in an open sand plunge, this makes it very easy to lift and divide the bulbs without any chance of damaging them in the process. Because we grow so many of our bulbs from seed we have lots of different clones. These not only vary in looks but also in when they will come into flower. 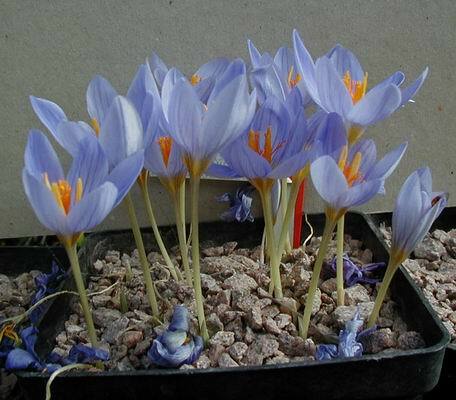 We have had a succession of flowers on various forms of Crocus speciosus for weeks now. 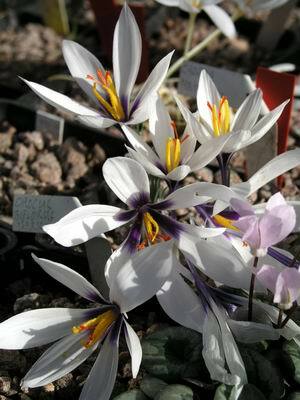 The same is true for Crocus banaticus. 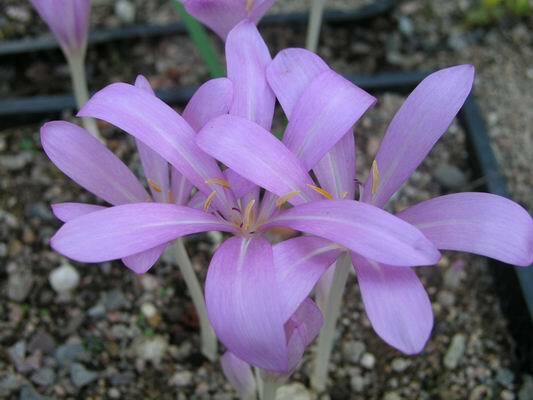 The best forms of Crocus mathewii have a lovely dark blackcurrant coloured centre. 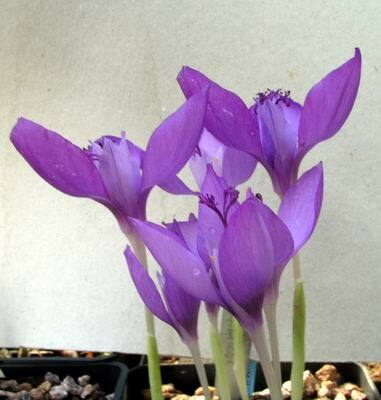 I will be home for next week's log and hope that this Crocus medius will still be in flower.